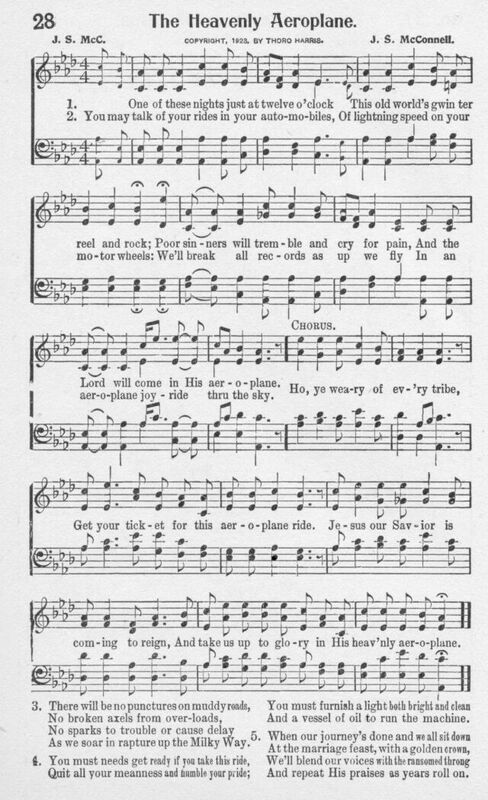 The music above and the transcription below are from Gospel Quintet Songs, Thoro Harris, c. 1928.
words and music by J. S. McConnell, copyright 1928 by Thoro Harris. And the Lord will come in His aeroplane. Get your ticket for this aeroplane ride. And take us up to glory in His heav'nly aeroplane. In an aeroplane joyride thru the sky. As we soar in rapture up the Milky Way. You must needs get ready if you take this ride. And a vessel of oil to run the machine. And repeat His praises as years roll on. This book verifies that it was written at LEAST as far back as 1928. It may well be older than that ~~ added 10/29/00 I just heard from John McConnell, son of the composer, and he gives it a date of 1920.